All of the resources at Miller Eye Center are focused on improving your vision. Our full medical staff of board certified cataract, corneal and retinal specialists, optometrists, and physician assistants are at the forefront of new and innovative ways to meet your vision needs, whether it’s experiencing the freedom of life without glasses, driving with more confidence at night, providing relief from irritated eyes caused by dryness or allergy, preventing the onset of diseases to the eye – or simply looking great in a new pair of glasses. Whether you’re here for a simple eye exam or a more involved appointment, your experience is important to us. You’ll find that our spacious 24,000 square foot office was designed with our patients in mind. We want your time at Miller Eye Center to be the best that it can possibly be. Most importantly, we are dedicated to fostering an enduring, caring relationships between patients and doctors. It’s one reason our rate of referrals is particularly high, and why we’ve been so successful in growing our practice since its inception in 1992. 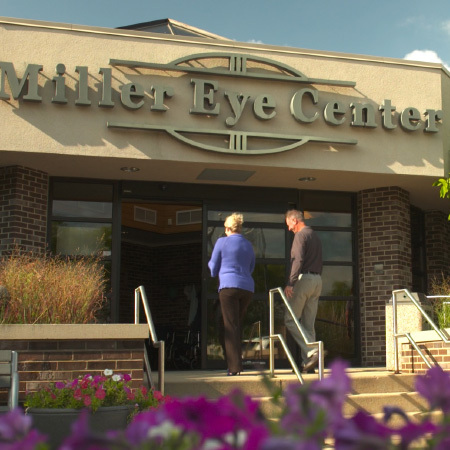 So take a closer look at Miller Eye Center: Find out why 57,000 patients currently come to our offices. You’ll like what you see.